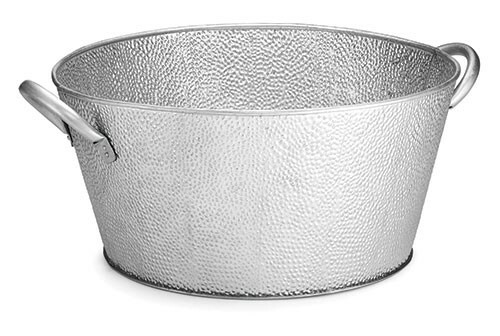 LionsDeal > Catering & Buffet Supplies > Ice Displays and Beverage Housings >< Beverage Tubs > TableCraft GT1515 Galvanized Steel Round Beverage Tub, 18-1/2" x 15" x 7"
TableCraft GT1515 Galvanized Steel Round Beverage Tub, 18-1/2" x 15" x 7"
The Swazie Galvanized Steel Round Beverage Tub, 18-1/2" x 15" x 7" is a flawless combination of style and function. These round beverage tubs are fashioned from sturdy material and specially coated to resist rust and scratching. Designed for chilling and serving bottled or canned drinks, these tubs have an intriguing pebbled look that complements both dressy or more casual tableware. Your wait staff will appreciate the two attached handles, which take some of the challenge out of carrying these tubs. 18-1/2" x 15" x 7"